Tens of millions of workers, small traders and truckers joined a nationwide bandh (general shutdown) across India yesterday called by opposition parties against the Congress-led coalition government’s “big bang” economic reform measures, which are designed to boost foreign and domestic investment at the expense of the working class. The widespread participation in the protest is testimony to the popular outrage over the government’s announcements. These will increase diesel prices by 14 percent, cut cooking fuel subsidies, open up the retail, aviation and media sectors to overseas companies, and further privatise major government companies. The diesel and cooking fuel price hikes will impact severely on living standards in a country where hundreds of millions live in poverty on less than $US2 per day. The opening up of the retail sector to retailers like Wal-Mart and Tesco, with their global supply chains, will cause great social dislocation, impacting on tens of millions of small shopkeepers and street hawkers. The opposition parties, however, called the shutdown purely to exploit the mass anger for their electoral gains, while at the same time working to dissipate it. In particular, the Communist Party of India-Marxist (CPM) effectively aligned itself with the right-wing Bharathiya Janatha Party (BJP), a Hindu supremacist party that sought to impose similar economic measures, before being ousted from office in 2004. The bandh had a significant impact, especially in states ruled by opposition parties. In Uttar Pradesh, West Bengal, Bihar, Madhya Pradesh, Jharkhand, Chattisgarh, Assam, Tripura and Odisha, as well as Karnataka and Jammu Kashmir, government offices, businesses, banks and schools were shut down. According to a railway official, 238 train services were disrupted. The Confederation of All India Traders (CAIT) said 50 million shopkeepers participated in the shutdown. The Confederation of Indian Industries (CII) estimated the losses due to “disruption in production and trade” at 125 billion rupees ($US2 billion). In the Indian capital of New Delhi, three-wheeler taxi drivers at main railway station refused to ply their vehicles. Big markets were closed. But public transport and normal life were not greatly affected. The bandh also had little impact in Mumbai, the financial capital, where two extreme right-wing regional parties—Shiv Sena and Maharashtra Navnirman Sena (MNS)—opposed the protest. In the southern state of Tamil Nadu, public transport ran normally. However commercial establishments and shops were shut down. The Tamil Nadu-based DMK, a partner of the ruling UPA, participated in the protest, in a bogus show of sympathy. Such was the intensity of popular hostility in West Bengal, that the ruling Trinamool Congress (TMC), a key ally of the UPA government, has been forced to declare it will withdraw its support from the government. The TMC actually opposed the bandh, with its leader, state chief minister Mamata Banerjee, declaring: “We have a big financial burden, and due to this strike will have an extra burden.” But the shutdown was almost total in the state, with vehicles off the roads, and shops, markets, schools and colleges closed. Industrial and plantation workers also joined the strike. At the same time, in a calculated move, Sitharam Yechury, a top leader of the CPM, and A.B. Bardhan from the Communist Party of India (CPI) joined BJP leaders on the rostrum at a rally of traders in New Delhi, after previously claiming that its protest had nothing to do with that called by the BJP and its allies. 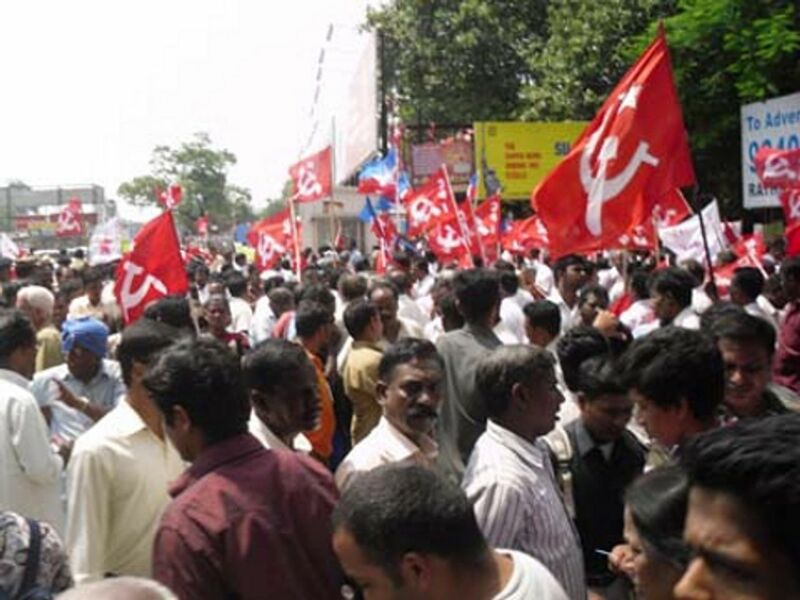 The CPM and CPI also joined regional and caste-based capitalist parties—the Samajwad Party (SP), Janatha Dhal (Secular), Telingu Desam Party (TDP) and Biju Janatha Dal—which they are seeking to promote as a “third front,” in order to divert the popular opposition behind these right-wing parties. The CPM has allied with the SP, even though SP leader Mulayam Singh Yadev has offered to keep the Congress-led United Progressive Alliance (UPA) in power. The UPA government has made plain its refusal to back down. It has indicated that if its parliamentary numbers were at risk, it would put off convening parliament for months and use regulatory measures to introduce further reform measures. Even as the bandh was taking place, the government announced that foreign direct investment would be permitted in retailing, with immediate effect. With the TMC’s withdrawal of support, the UPA will become a minority government, with 259 members in the 545-member parliament. But Finance Minister P. Chidambaram told reporters the government was not facing “any threat” to its stability. A spate of editorial commentary and statements by big business leaders have made it abundantly clear that if the government did bend, the ruling elite’s support for the UPA would collapse. The international credit rating agencies, for their part, have threatened to slash India’s credit rating to junk status if urgent action is not taken to slash the budget deficit and promote foreign investment. The entire Indian ruling class has moved over the past two decades to forge a new partnership with international capital, in which it seeks to enrich itself by providing cheap labour and resources to global big business. A genuine movement in opposition to imperialism and international capital will only be developed through the independent political mobilisation of the working class in opposition to all factions of the bourgeoisie on the basis of a socialist and internationalist perspective.